Friends for Our Riverfront: "Seldom Seen View of the Father of Waters"
"Seldom Seen View of the Father of Waters"
The only thing constant about the River is that it is constantly changing - the water, the light, the perspective, the shoreline. Congratulations to FfOR board member Jeanne Arthur, who captured this unusual, organic view. 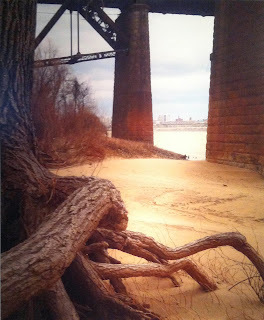 The photo, "Seldom Seen View of the Father of Waters," won the 1st prize in photography at Dixon Gallery and Gardens in the 2014 Memphis Garden Show.